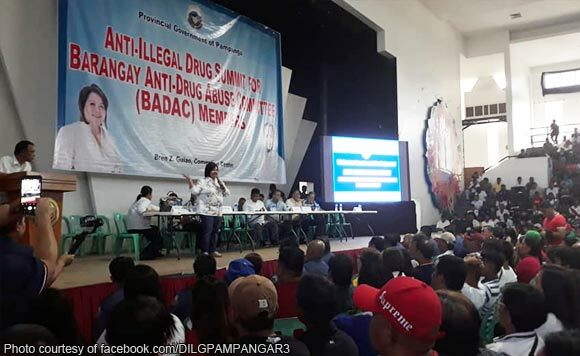 Members of the Barangay Anti-Drug Abuse Councils (BADAC) all over Pampanga province held Friday a summit at the Bren Guiao Convention Center in San Fernando City. Governor Lilia Pineda presided over the gathering that drew more than 4,000 BADAC members, according to the provincial office of the Department of Interior and Local Government. “Isa ang Pampanga sa mga pinakamaayos at payapang probinsya. Hindi ito mangyayari kung hindi dahil sa inyong sipag at dedikasyon,” Pineda was quoted by the DILG Pampanga to have said at the event. “Pero ‘wag tayong huminto dito. Ipagpatuloy natin ang trabaho at pagsiguro na walang iligal na droga ang papasok sa mga barangay natin,” she added. During the program, DILG provincial chief Myrvi Fabia presented the results of the 2017 BADAC Functionality Assessment.